HomeDog BehaviorWhy Do Dogs Eat Dirt? Is It Bad for Them? Why Do Dogs Eat Dirt? Is It Bad for Them? Dogs are fascinated by many things; shadows, feet, trash, and yes, dirt. If you have ever cared for a dog, you will know they have quirky behaviors and frequently do things which confuse us! It’s all part of the deal you signed up for. You dog has been eating dirt again. Dogs eating potting soil and clumps of dirt is not uncommon. However, is this something you should worry about? Can your dog get sick from eating dirt? Is it bad for a dog to eat dirt? Does your dog have a mineral deficiency if they eat soil? Sometimes, there is absolutely no reason why you dog is eating dirt. They just like the taste or sensation. Sometimes, your dog will eat dirt due to a lack of nutrition, heath issues, behavioral issues or a lack of exercise. If there is a reason behind your dog eating dirt, you don’t want to ignore it. 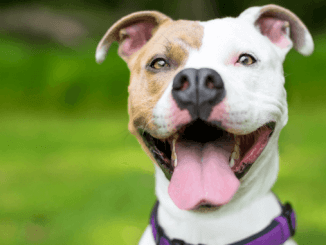 If you want to know the four reasons why dogs eat dirt, if eating dirt is dangerous for dogs, what you should do if a dog eats dirt and how to stop a dog from eating dirt, then continue reading. 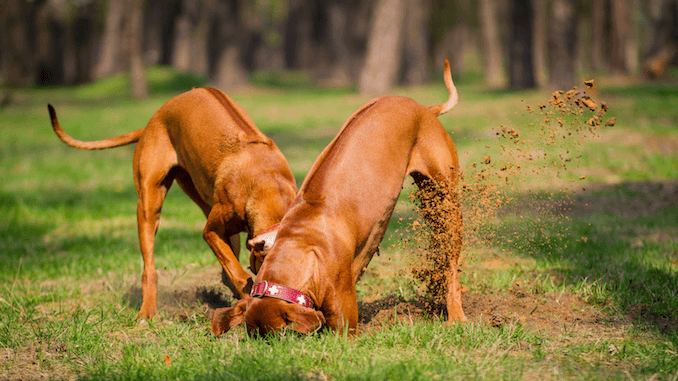 Two Rhodesian Ridgebacks digging and eating dirt. Dogs explore the world around them with their nose and mouth. A dog’s nose is better than an average human’s nose by a ratio of between 10,000 to 100,000 to 1. When a dog uses their mouth to explore the world, by eating items other than food this is known as pica. Exploration as a Puppy and It’s Just Tasty and Fun! Puppy Exploration; Dirt is Tasty and Fun! The most common reason for your dog eating dirt is because they are exploring and it is fun for them. Young dogs, especially puppies, go through an exploration stage; just like babies. A puppy will attempt to put almost anything in their mouths to chew or taste; this includes your new shoes, an important piece of paper and dirt! It’s important to know, this behavior should not be encouraged or rewarded but is considered normal for puppies. So then, why do old dogs eat dirt and sand too? Sometimes it might not be the dirt your dog wants. If you have ruled out the other three medical reasons in this guide (read below), and your dog eats dirt consistently, it’s just a bad habit your dog has developed; read How To Stop a Dog from Eating Dirt. 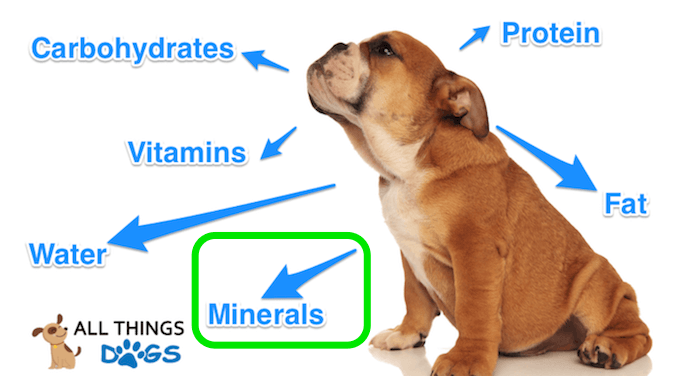 Your Dog is Searching for Nutrients; Specifically, Minerals. A healthy and strong dog requires a balance of six important nutrients. One of these six nutrients is minerals. The most important minerals in a dog’s diet are phosphorus and calcium. Dogs need essential minerals (e.g. Calcium) for strong teeth and bones, but, also nerve impulse transmission and enzymatic reactions. These essential minerals should all be found in good quality chow, however, lower quality, homemade, or cooked dog food can sometimes have deficiencies or imbalances. Therefore, your dog may be in search of specific minerals or probiotic bacteria. This can be common when a dog’s nutrition comes entirely from dry processed foods with limited digestive enzymes. Dirt does contain minerals; different types of soil has different types of minerals. It’s important to remember, dietary deficiency is a rare cause for your dog to start eating dirt. However, you should work to remove it from possible causes. If your dog is digging wildly, with dirt flying and chewing lots of dirt. The likelihood is; they aren’t searching for anything specific (i.e. don’t have a deficiency). You should move past this section and read possible behavioral issues. However, if your dog is inspecting the dirt slowly with their tongue; they are searching for something specific. You can also do a manual check on your dog’s diet to make sure it’s nutritionally complete. Keep a diary of what your dog typically eats day-to-day and compare that against a recommended daily diet; for your breed and life-stage. You will want to make sure your dog’s primary chow contains all of the recommended minerals and vitamins. Compare their diet against The Association of American Feed Control Officials recommended diet. Your dog may be suffering from indigestion. So far you have ruled out your dog is going through an exploration stage and a lack of nutrients. It is possible your dog is soothing gastric or digestive problems such as indigestion. Dirt is a natural indigestion reliever. Most dirt will contain small quantities of clay, which has health benefits and will ease discomfort. If your dog eats dirt occasionally, around one to two hours after eating, this is a sign of indigestion. Dog medical problems such as inflammatory bowel disease, gastrointestinal ulceration or gastric irritation are sometimes underlying causes for your dog eating dirt; however like dietary deficiency, medical problems, are a rare cause for your dog to start eating dirt too. These medical problems can cause bleeding of the bowel, where your dog will be trying to obtain more iron from the dirt in response to the anemia triggered by blood loss. You should make sure to check your dog’s stool for blood. 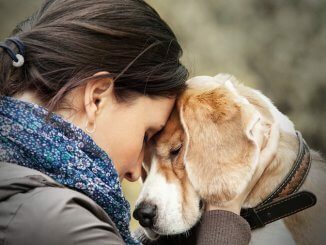 With regards to health conditions and medical problems with your dog; the best advice is to always seek professional guidance. Visit a vet, the sooner the better. If it’s not a health issue causing your dog to eat dirt, then what is it? A dog needs a purpose to exist. Just like humans; when a dog doesn’t receive mental and physical stimulation, unwanted habits and behaviors will emerge. These habits may result in destructive behaviors (i.e. chewing) or strange ones (i.e. eating soil). This is true of all dogs, however, high intelligence (i.e. Puggle) or high energy (i.e. working dogs) breeds will be more susceptible to displaying these behaviors. Most dogs are naturally designed to be outdoors and active. Use the summary table below to be better understand why your dog is eating dirt. Is your dog mentally satisfied? If your dog isn’t being mentally stimulated; then boredom will set in. Dogs that have daily play-time and training-time display far less behavioral problems. Training gives a dog something to think about… other than eating soil by occupying their brain power! Chew toys are also a great aid during training and games. Is your dog exercised daily? If your dog isn’t getting suitable physical exercise; they will be prone to stress. Exercising your dog allows them to release their energy and is scientifically proven to relax your dog. 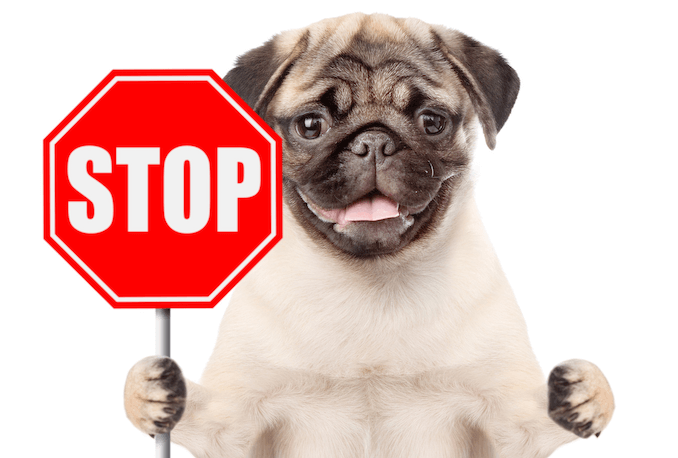 Is your dog starved of attention? Dogs which are left home alone for longer periods of time (over 3 hours/day) require attention. An easy solution is to bring in a professional dog walker or find a suitable daycare center. Is your dog getting the correct vitamins? If your dog’s diet isn’t nutritionally complete this can cause behavioral issues. American Journal of Veterinary Research published a study showing dog’s deficient in Vitamin B1 develop coprophagia. At this point, you should have a good understanding or the tools to understand the four main reasons behind your dog eating dirt. Is it Dangerous for a Dog to Eat Dirt? 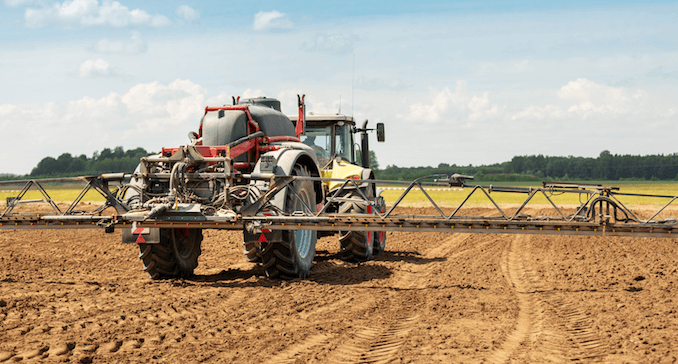 Dirt can contain fertilizer, lawn chemicals, toxins, pesticides and poisons. A dog eating dirt is not uncommon! Hence, you and thousands of others reading this article. In many cases, as discussed above – unless your dog is a frequent offender of eating soil, then it is not a cause for concern and should be trained away. When a dog consumes earth, clay or soil (i.e. geophagia) the ASPCA say it’s generally safe. Unlike other foreign materials, dirt won’t get stuck in the stomach lining. You should exercise some caution though. Dirt isn’t always just dirt. If congested by your dog, these chemicals contain harmful bacteria that may make your dock sick. This is typically a common-sense rule, if a dog eats dirt in your yard; it’s probably safe. A dog eating dirt near construction sites or agricultural fields; probably not safe. Ensure your dog is wormed regularly, in accordance to a certified schedule, to avoid intestinal parasites resulting from eating dirt. What Should You Do If Your Dog Eats Dirt? A puppy, or dog, displaying this behavior should not be punished or receive negative training. Positive reinforcement of good behavior is always better. With this tip in mind, follow our five steps process. Before you undertake any analysis, you should prevent your dog from eating soil. This is very important whilst you, or your vet, go through the elimination process. When you see your dog eating dirt, simply move them away from the dirt and use positive reinforcement training by offering a leather chew to play with. Train without Pain. A dog owner should never use force or fear to train a dog. Analyze the frequency of which your dog is eating dirt and where they are eating dirt from. If your dog is frequently eating from the same area, check the area for potentially something the dog is trying to get to. This is an easy fix, remove whatever you dog is trying to eat! 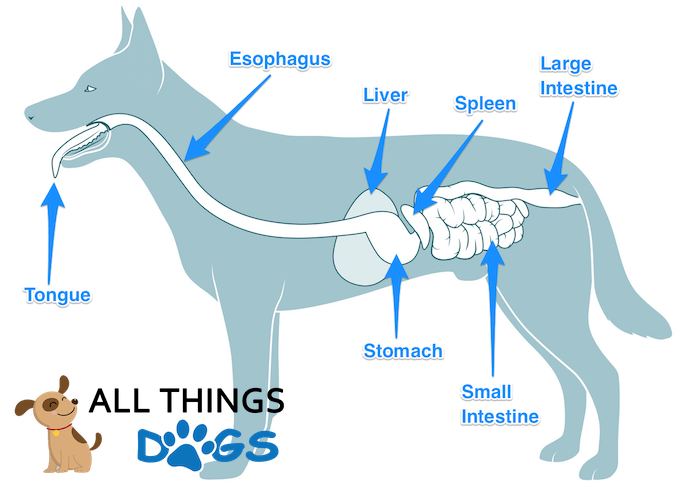 If you dog is eating dirt frequently after meal times, this could be a symptom of digestion issues. If your dog eats soil in a somewhat random pattern then continue to step three. Earlier we discussed what an AAFCO balanced diet is and the importance of vitamins and minerals. 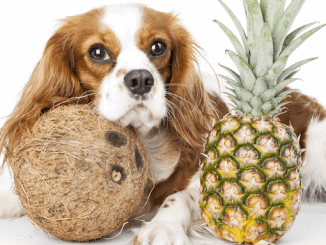 A nutritionally complete diet prevents diet-associated diseases for your dog. If there is an issue with the nutrition cycle of your dog’s feed, a dietary or environmental change is required. It’s important to remember, you should not change your dog’s diet instantly. Start by introducing smaller quantities of new food and reducing the volume of their old food. If your dog has a healthy and nutritionally complete diet, the next step is to perform a physical inspection. Watch your dog during defecation to make sure they aren’t having any difficultly and there isn’t any blood in the stool. Check your dog’s gums after eating to make sure they aren’t very pale. If you detect either blood in your dog’s stool or very pale gums, it is a trip to the vet. The final step when it comes to what you should do if your dog eats dirt is to take them to the vets. You have exhausted all the steps a dog owner should take when diagnosing why a dog is eating dirt. If you haven’t found the root cause (e.g. boredom, dietary problems, behavioral issues) it’s time for a professional to step-in. A local veterinarian will perform routine blood work to eliminate serious medical conditions (e.g. Small Intestinal Bacterial Overgrowth) by completing blood counts, adrenal and pancreas tests. A vet might also suggest x-rays if you dog has been very tired lately, showing signs of exhaustion or weight loss. Once you are confident there are no medical or dietary reasons behind your dog eating dirt; it is time to correct this behavior. No matter the reason behind eating soil, clay or dirt, this isn’t a positive habit for your dog and may lead to more destructive patterns. There are multiple techniques you can use, so don’t give up on your first attempt of prevention! You have puppy proofed your home; why not your garden? Using a crate or physical barrier can easily prevent your dog from eating topsoil. When you dog is outside, observe them. Dogs which are left outside alone can get into mischievous behavior patterns. If you catch your dog preparing to eat soil, immediately stop this behavior by in initiating a non-compatible activity such as chase or catch. Make sure reward and praise are constantly used, as with most dog training, force or shouting will absolutely not work. When your dog stays away from dirt, make sure to give them lots of attention and praise. A dog or puppy should not be punished for eating dirt. 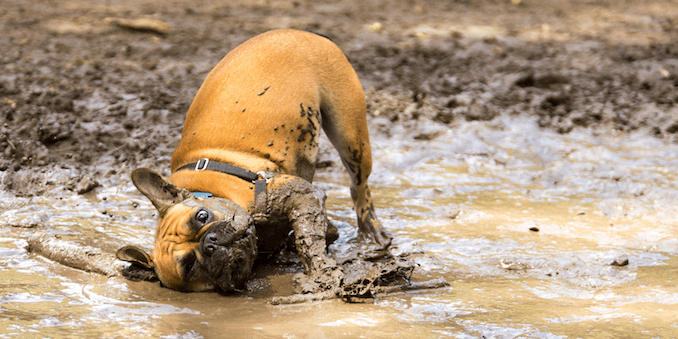 Sometimes this behavior can be triggered due to poor diets or underlying health conditions, however, more common reasons for a dog eating dirt can be behavioral issues, a lack of attention or exercise. Our five-step process of excluding soil, analyzing the behavior, checking their diet, checking your dog and visiting a vet will reveal the root cause. Any reason behind eating soil or clay should not be ignored and can be prevented by preparing and restricting your yard, supervising your dog whilst in the garden and positive reinforcement training. Has your dog recently taken to eating dirt? Or have you successfully trained your dog to stop eating dirt? Feel free to share your tips and advice in the comment section below.